Home > Griots Garage Vinyl & Rubber Dressing 35 oz. Griots Garage Vinyl & Rubber Dressing 35 oz. Protect rubber and vinyl with a classy concours finish. Griot's Garage Vinyl & Rubber Dressing leaves a highly protective, natural-looking finish on interior and exterior surfaces. 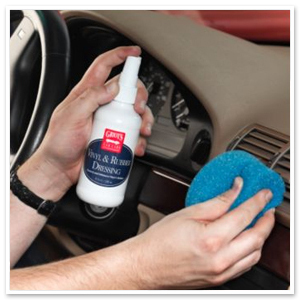 Make your dashboard, rubber trim, moldings, and tires look like new! Griot's Garage Vinyl & Rubber Dressing is the best choice for a concours look. This is the product you've been looking for, for tires that will pass the scrutiny of any concours judge. Griot's Garage Vinyl & Rubber Dressing is superior when judged against other rubber protectants because it provides the low-shine, matte finish that looks like real rubber. There's nothing artificial about the look and the protection offered by Griot's Garage Vinyl & Rubber Dressing. Griot's Garage Vinyl & Rubber Dressing dries quickly and leaves behind a smooth, non-greasy matt-black look - the way rubber is supposed to look! It contains no petroleum distillates or other dangerous solvents that can harm and dull the surface of vinyl and rubber over time. Special ultraviolet (UV) blocking agents leave behind a protective coating to help keep your vinyl and rubber parts from cracking, fading and hardening. Griot's Garage Vinyl & Rubber Dressing is real protection for vinyl and rubber parts. Vinyl and rubber surfaces that are protected from UV rays and hydrated will naturally look better over the long term. Griot's Garage Vinyl & Rubber Dressing restores and protects rubber and vinyl. Griot's Garage Vinyl & Rubber Dressing works equally well on interior and exterior rubber and vinyl. Because the finish is non-greasy, you can use it inside without a sticky, dust-collecting film. Surfaces will look clean and new! Clean rubber and vinyl surfaces using Griot's Garage Rubber Cleaner. Then apply Griot's Garage Vinyl & Rubber Dressing with a clean foam applicator pad. Griot's Garage Vinyl & Rubber Dressing achieves professional results on interiors, exterior trim, tires and all the plastic and rubber parts in your engine bay, too! It's a favorite at Pebble Beach Concours d'Elegance and it will become a favorite in your garage.